Shooters from all across the country are complaining about an ammo shortage — and no one seems to know why. Consumers can’t get ammo from dealers, because they aren’t getting it from manufacturers and distributors and there is as yet no explanation of the sudden shortage. 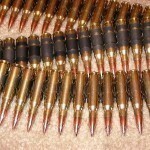 This shortage started in the .308 caliber (7.62mm) and for a long time that was the only caliber affected. Then .223 caliber ammunition started becoming difficult to find. Now people are starting to complain about 9mm ammo being more difficult to acquire. Is it a coincidence that these are the top three small arms calibers employed by the U.S. Armed Forces? The military purchased the vast majority of it’s ammunition from Alliant Techsystems, which manufactures it at the Lake City Army Ammunition Plant in Independence. Because of this, shortages in the military and civilian ammunition markets do not generally effect each other. However, shortages in raw materials could affect both markets. India, China, and other emerging economies are experiencing a huge demand for metals such as copper and lead. These metals are also used to manufacture ammunition. The price of these materials has tripled over the last few years and some ammunition manufacturers may be experiencing a supply shortage. Does OSHA Share the Blame? OSHA is currently working on new rules that will reclassify ammunition as “explosives.” This could make it prohibitively difficult for your local Wal-Mart to sell ammunition. The OSHA regulations, as written, would require every Wal-Mart store to be evacuated during thunderstorms. Ammunition manufacturers have to look at bureacratic idiocy like this and consider how it will affect their ability to sell ammunition in the future. If they believe that their ability to sell ammunition will be limited in the future, they will not invest in plants and equipment today. The way the U.S. Presidential elections look today, we could soon see the Bill Clinton Gun Ban of 1994 replaced with the Hillary Clinton Gun Ban of 2009. That can’t look good to anyone who is considering an investment in an ammunition company. Clue Phone for Katie Couric!